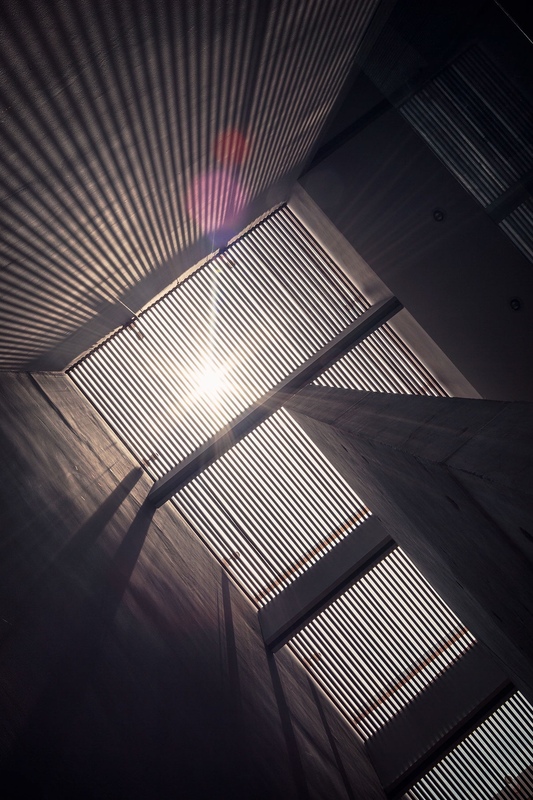 Modernist architecture (also known as International Style) is defined by thin linear forms, exposed metal frames, concrete cladding, and little ornamentation – characteristics often met with hesitation due to the perception that strict functionalism leads to overly minimalistic spaces. 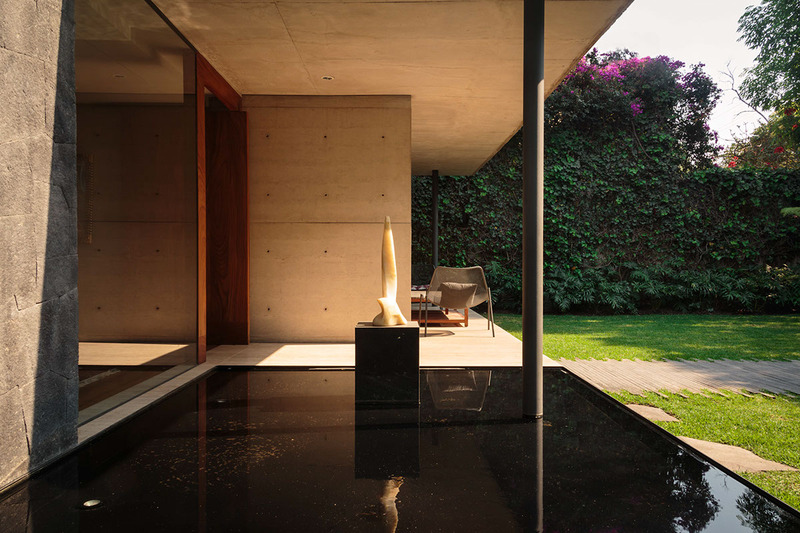 But these beautiful homes by José Juan Rivera Río demonstrate a more vibrant side of this iconic architectural genre: organic, atmospheric, and endlessly adaptable. 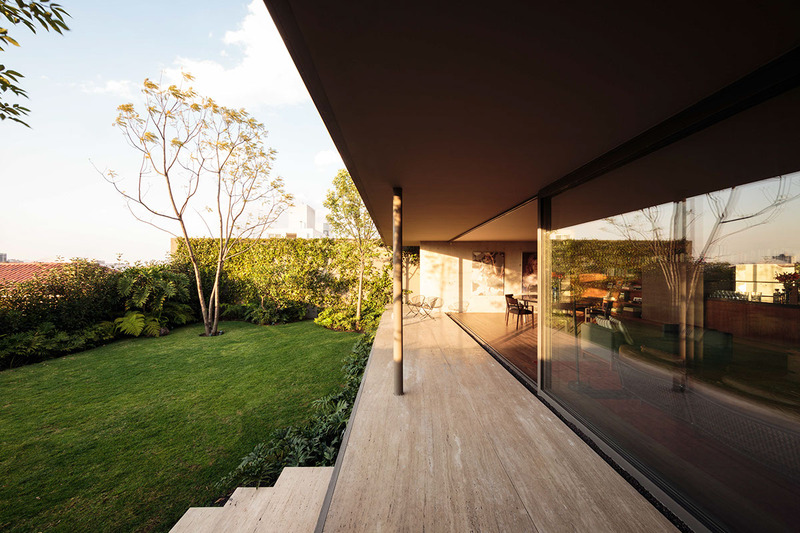 Located in the prestigious Mexico City neighborhood of Lomas de Chapultepec, all three homes reject the monolithic mansions that surround and instead opt for clarity and organic appeal. Thanks to its slim and refined construction, Sierra Fría cuts a sharp profile against the steep cascades of colorful vegetation that surround the property on either side. 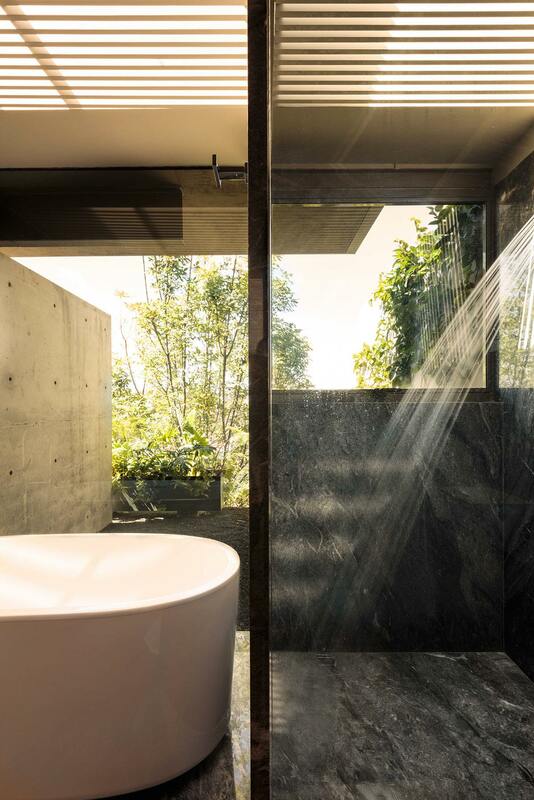 Nature generously provides the privacy so the architects could fully embrace the glass elements that serve as one of the most important defining features of international style architecture. 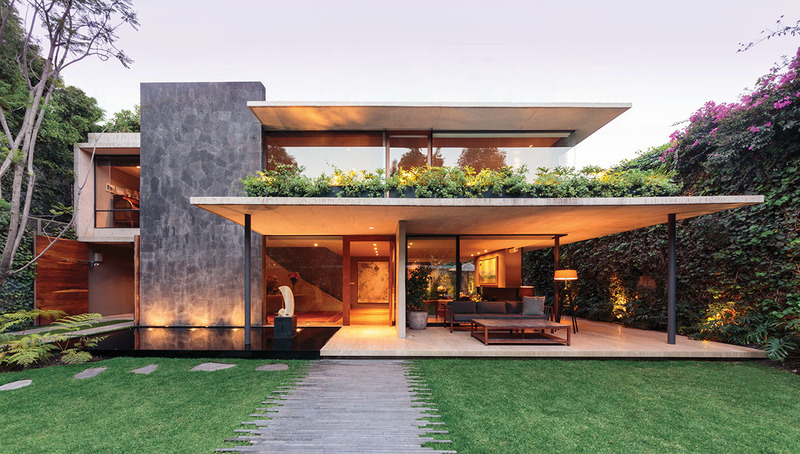 Volcanic stones pave the walking path and portions of the exterior, enhancing the exterior’s connection with the earth. 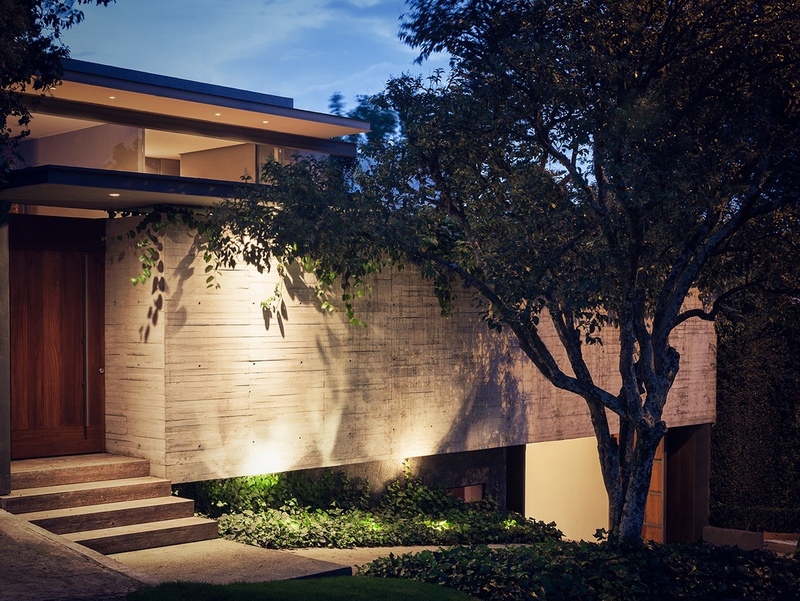 Over time, natural weathering effects will color the stone and concrete for a more integrated aesthetic. 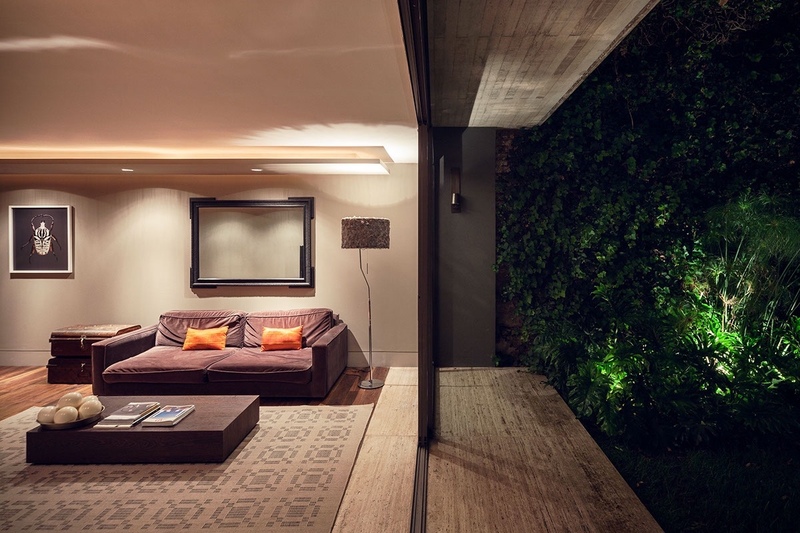 Natural elements continue to play just as important of a role inside the home. This time, clean lines of wood grain stand in contrast to the untamed foliage and grey textiles replace the rough texture of stone cladding. 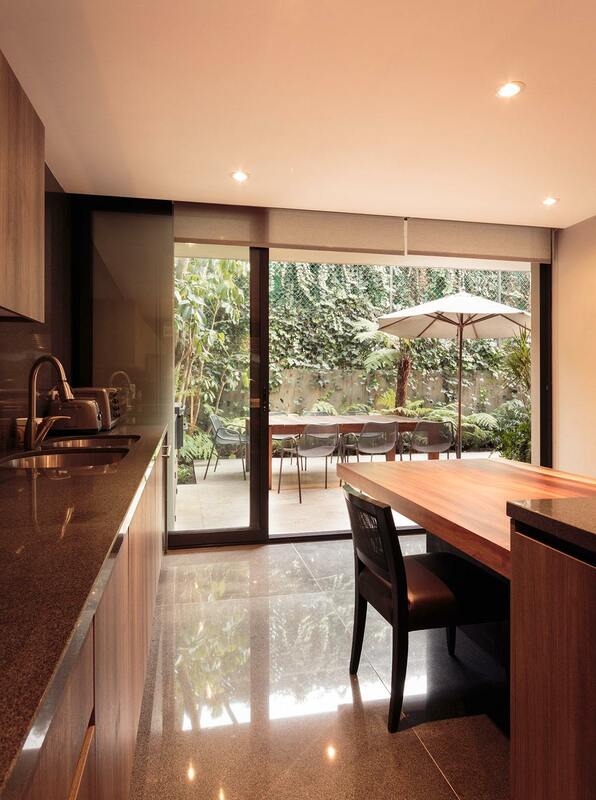 Exterior courtyards facilitate indoor-outdoor living – like this dining table situated conveniently outside the kitchen. 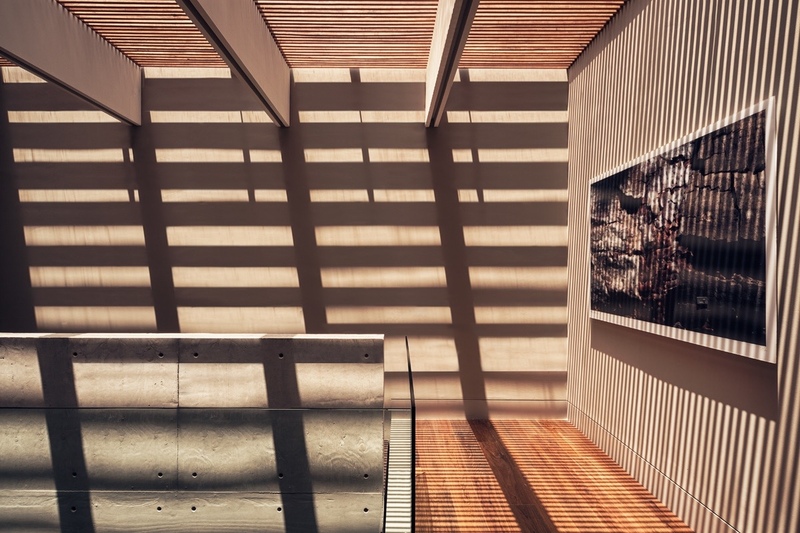 Light floods the atrium, a catalyst to reflect the warmth of the wood floors onto the grey concrete walls. 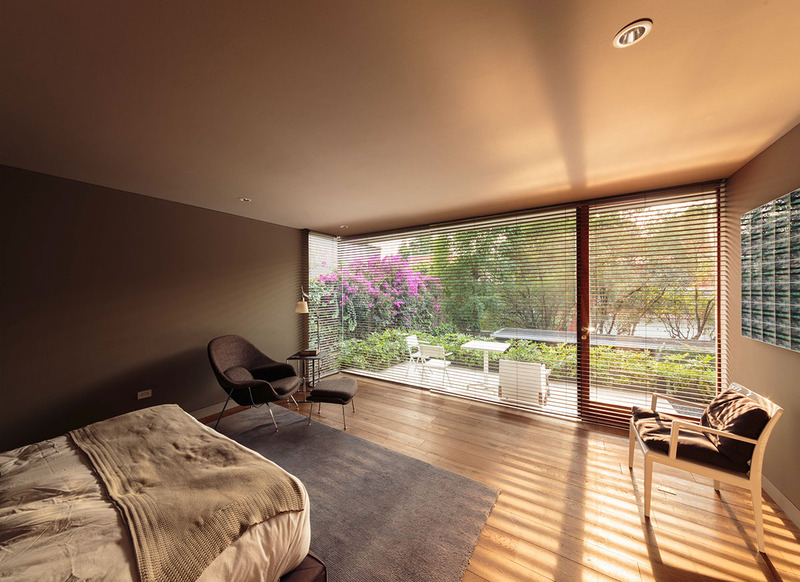 Bedrooms, too, have their own personal patios and gardens. 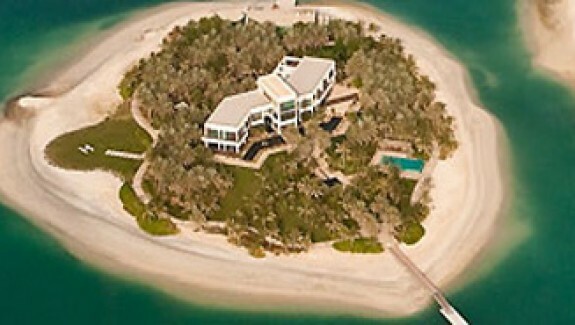 This one overlooks the cool waters across the yard. 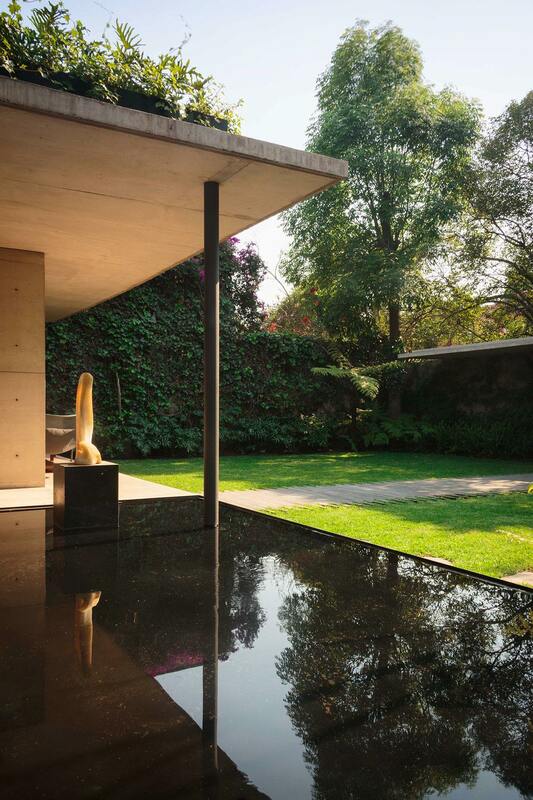 Shallow water conditions the air as it flows into the home, an effective cooling solution for the Mexican dry season. It also provides a unique way to appreciate the provocative sculpture that greets visitors at the entrance. 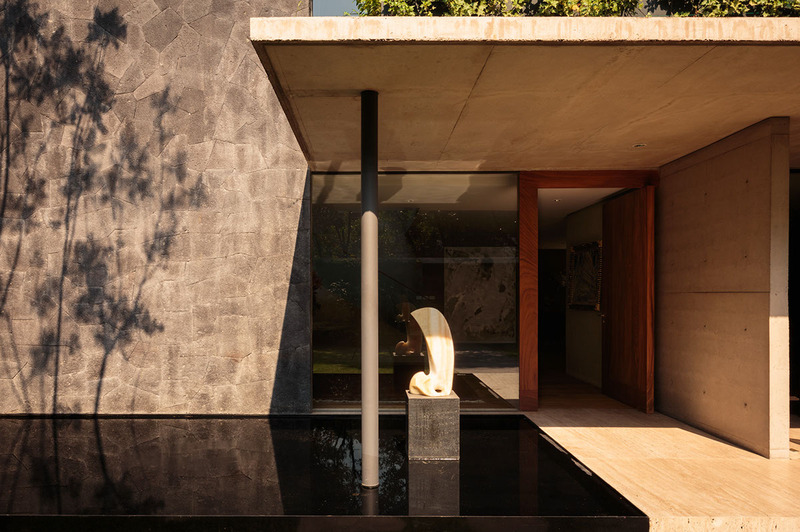 Jet-black pool lining creates the illusion of infinite depth and erases the transition from the water to the sculpture’s pedestal. 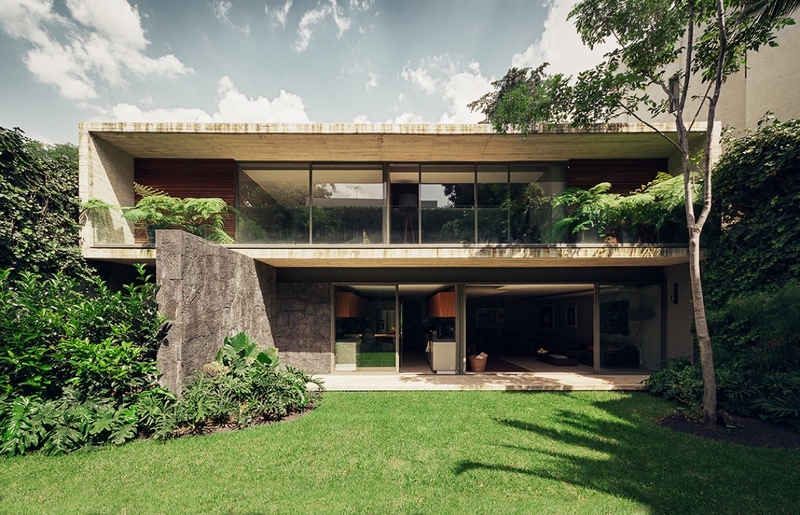 Exhibiting the same horizontal emphasis of the previous home, Monte Cáucaso differentiates itself with a stronger and more defined outline of concrete cladding. 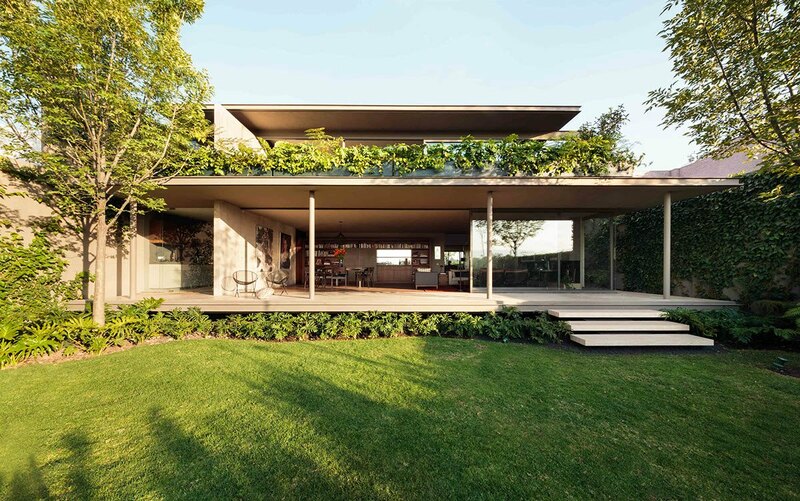 But it too embraces greenery and natural materials at every opportunity. 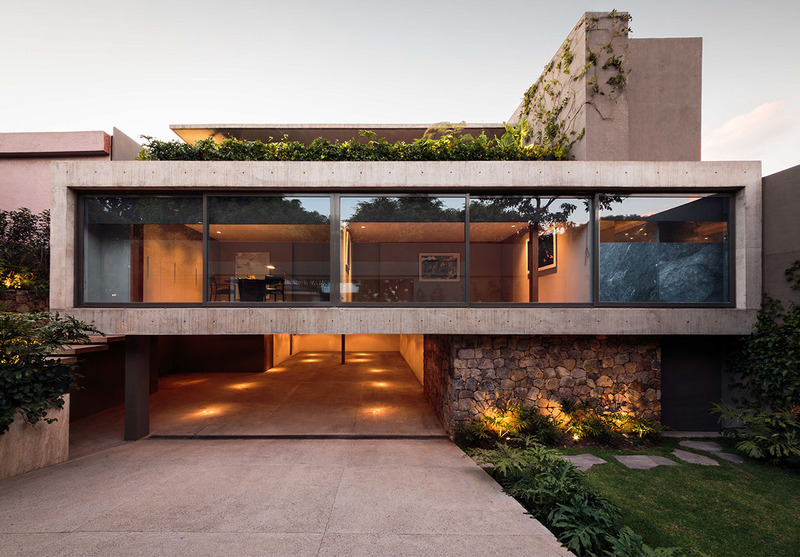 The home consists of a main living volume suspended over a spacious garage, surely to the delight of automotive enthusiasts. 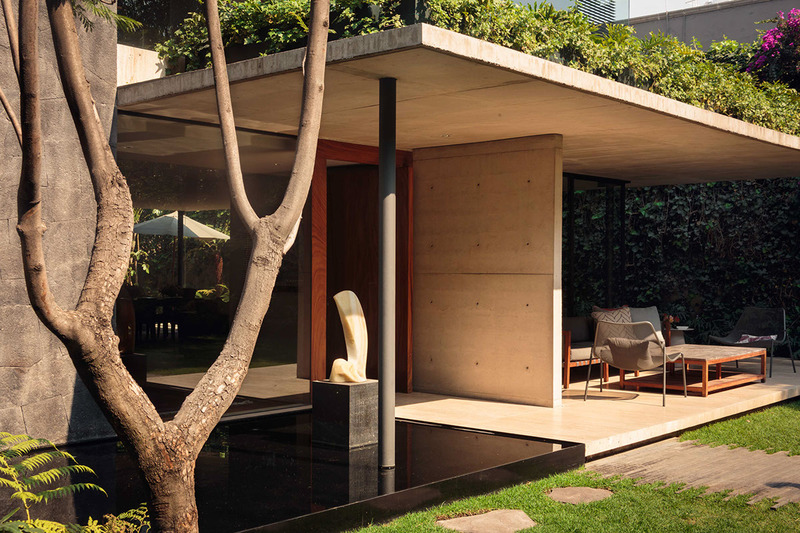 A private front yard allows for complete openness to the outdoors, with thin pillars (a most defining feature of the International Style) barely obstructing the view at all. 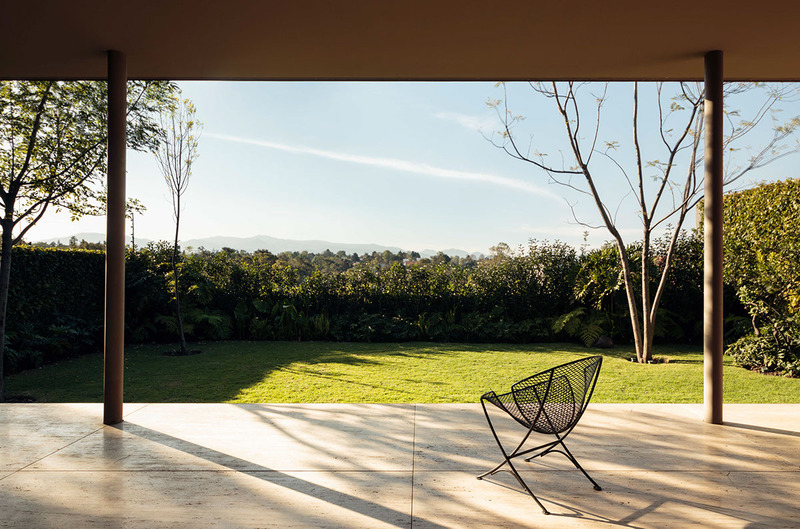 In the open plan living room, sliding doors completely erase the boundary between indoors and out, taking full advantage of the clever landscaping that surrounds. 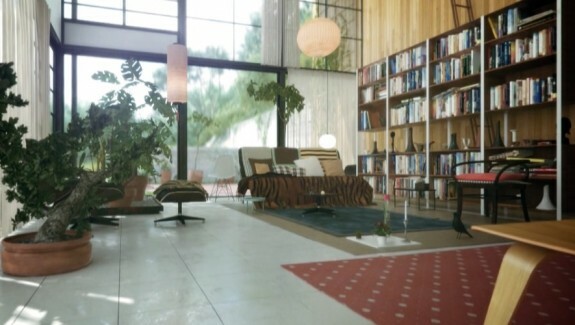 Decor primarily falls into a spectrum of deep red and orange. 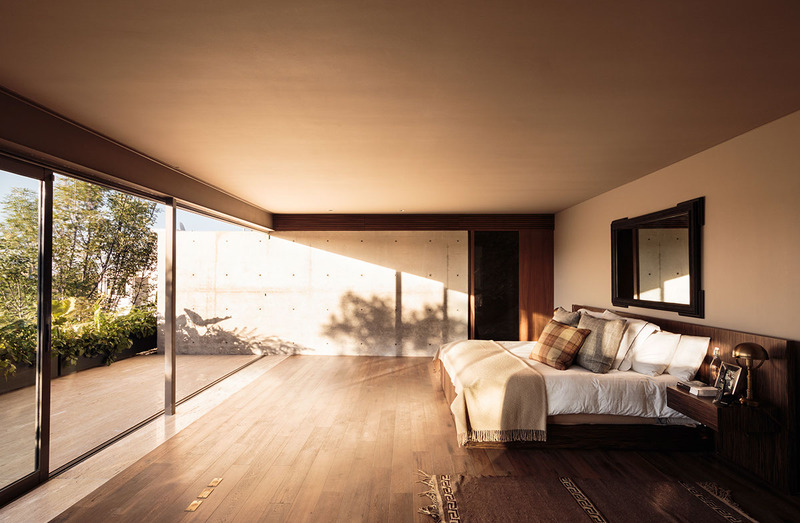 Wood floors follow the horizontal arrangement of the living area, sometimes continuing up the wall in vertical panels. 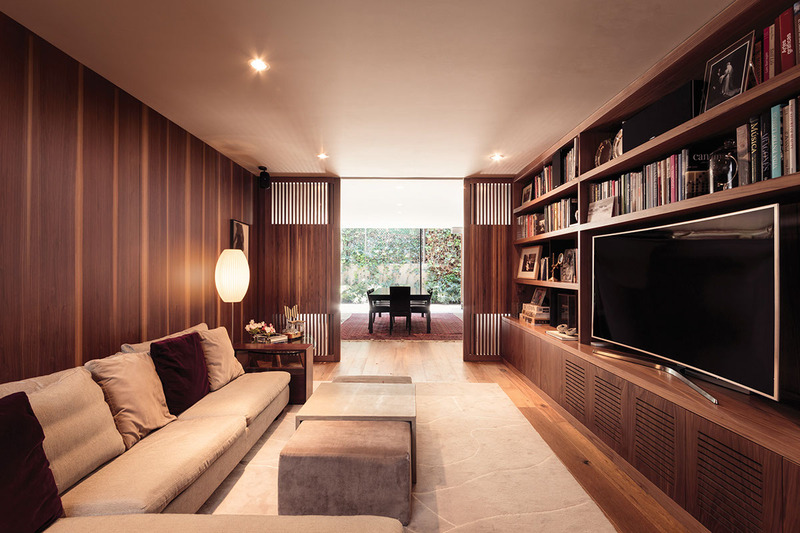 Between the open living room and the bedrooms at the rear of the home, hallways feel more like independent bridges that link one space to the next. 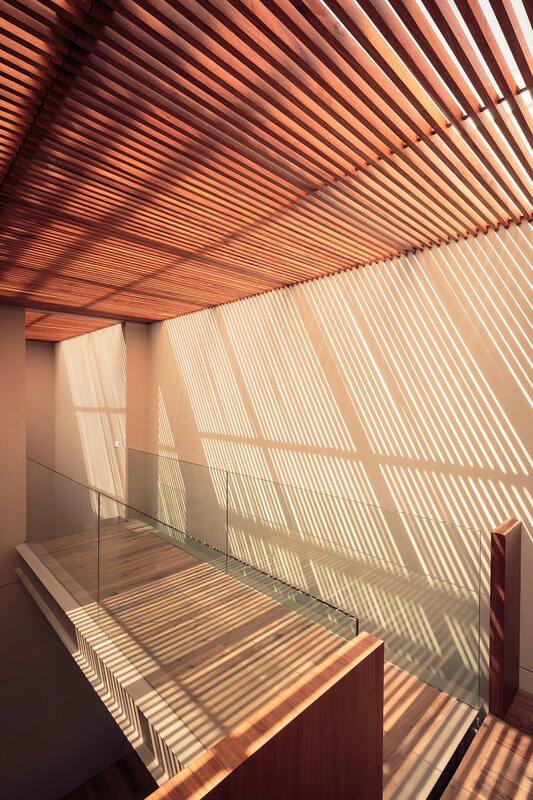 Traversing these stairwells and hallways will feel different at every time of day thanks to the changing quality of the light as it filters through the distinctive slatted ceiling. Bedrooms closely echo the interior decor style of the living room, but enjoy a greater sense of intimacy thanks to the lower ceilings. 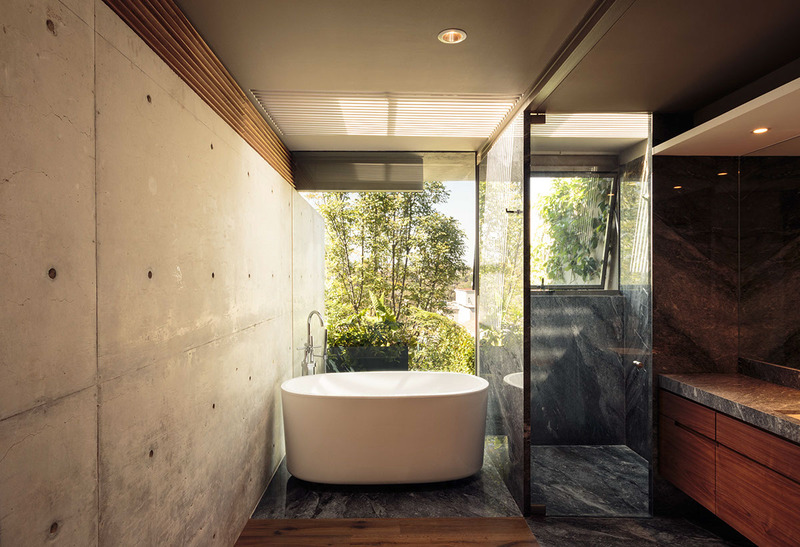 A slatted skylight and natural materials deepen the bathroom’s impressive connection with the outdoors, while half-walls and outdoor landscaping secure the privacy of the residents. Textural contrast enhances the effect of each material independently: the concrete wall, smooth stone, and the untamed foliage. 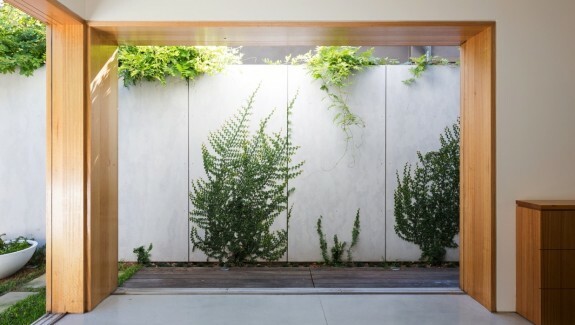 Vines cascade down surrounding privacy walls, disguising the utilitarian nature of their design. 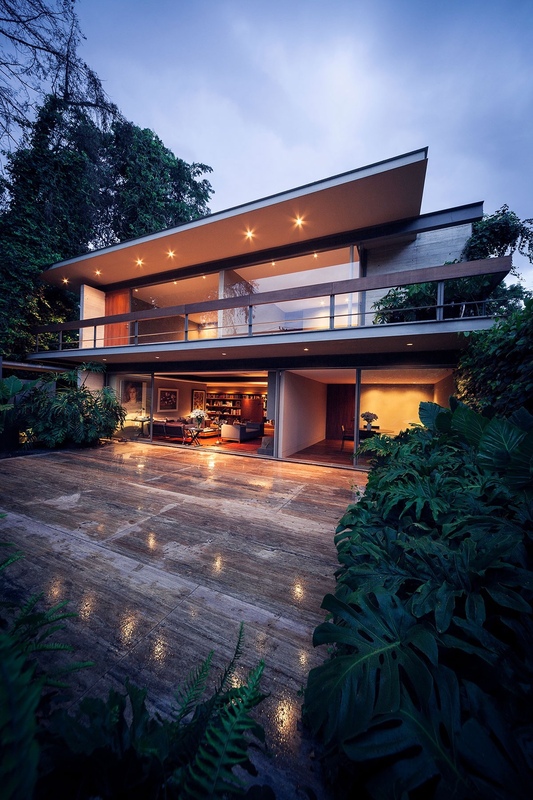 Finally, Sierra Leona – this lovely residence offers the perfect architectural compromise between the streamlined forms of the first home and the boldness of the second. 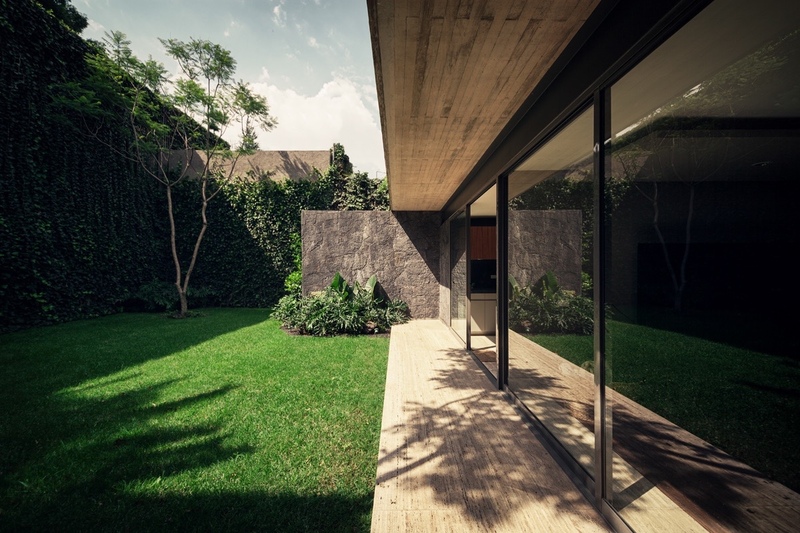 The construction builds up from the center of the plot, surrounded by a paved courtyard (featured here) and a spacious garden in the back. 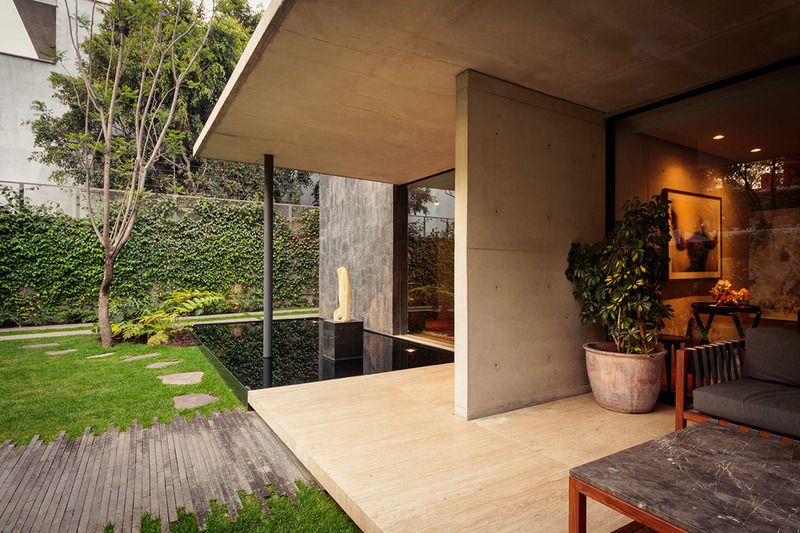 At the back of the house, a hefty wall of stone makes a distinct impression as it intersects the concrete facade. 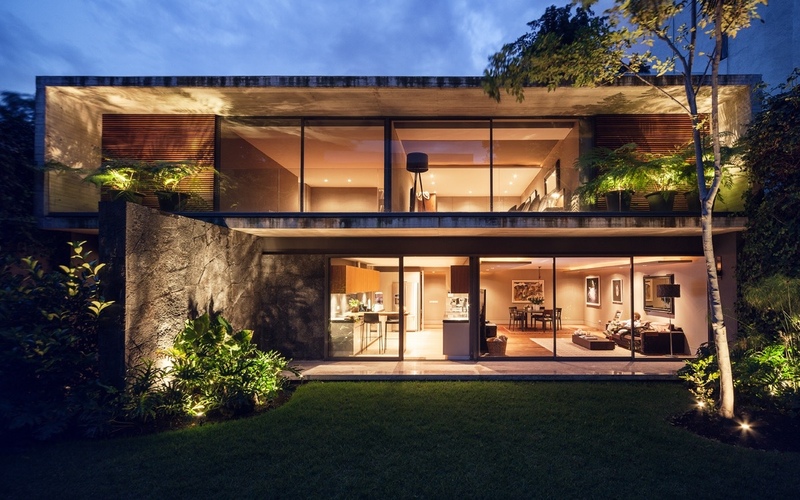 But unlike the previous home, it doesn’t continue into the building but rather terminates at a fixed point. Tall vine-covered walls shield the open interior from other nearby properties, creating an ideal private retreat where the family can gather. 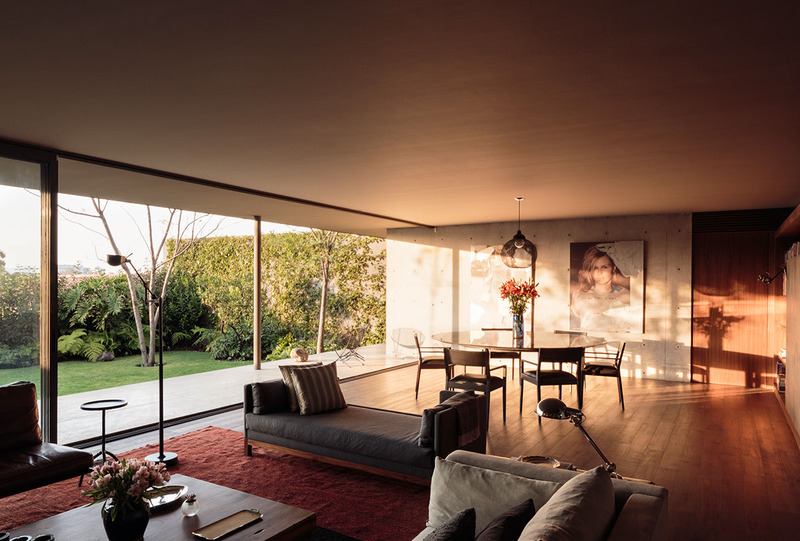 Social spaces like the living room and kitchen face outward toward the private garden, with bedrooms occupying upper floor. 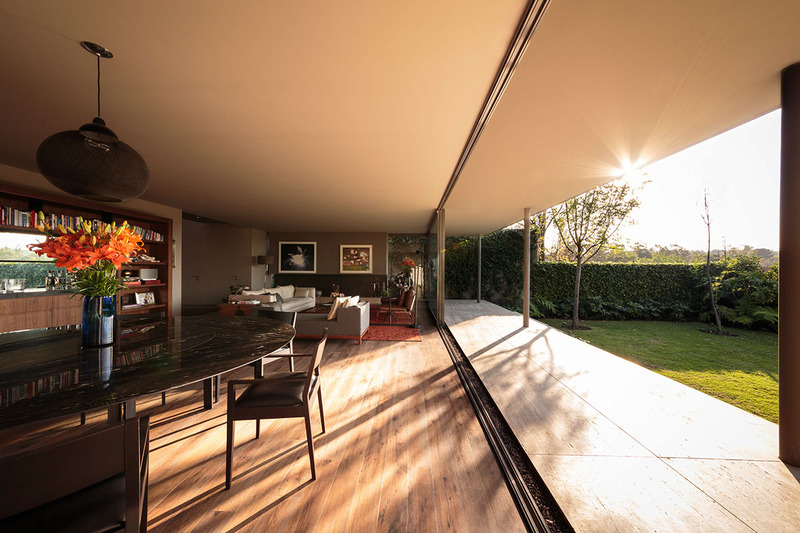 Like the other homes in this post, many of the social areas take advantage of sliding doors for indoor-outdoor living – but the effect is more subtle here. 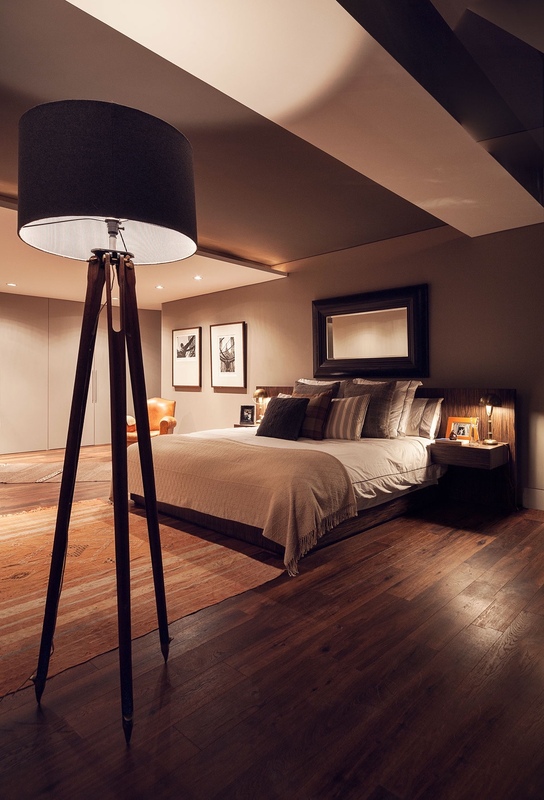 Layered planes bring interest to the bedroom ceilings and facilitate interesting lighting effects. When the recessed lighting feels too overwhelming, residents can relax to the toned-down ambiance of a warm and indirect glow. 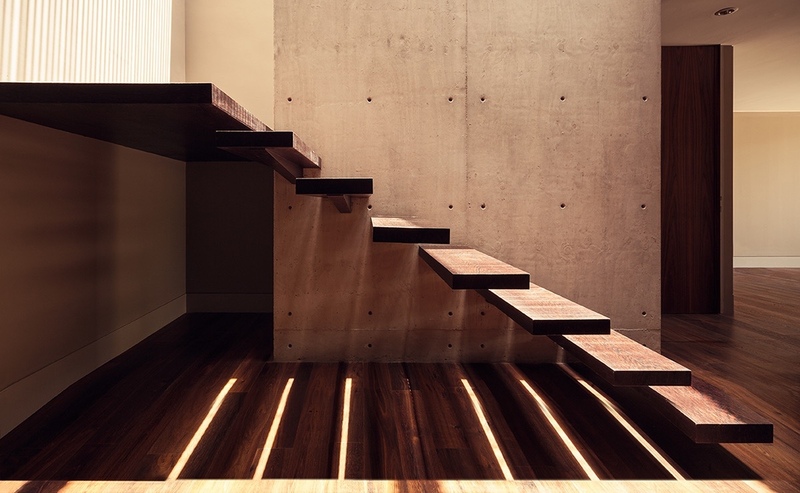 Cantilever stair treads protrude from concrete walls, the simple construction allowing material to take precedence over form alone. 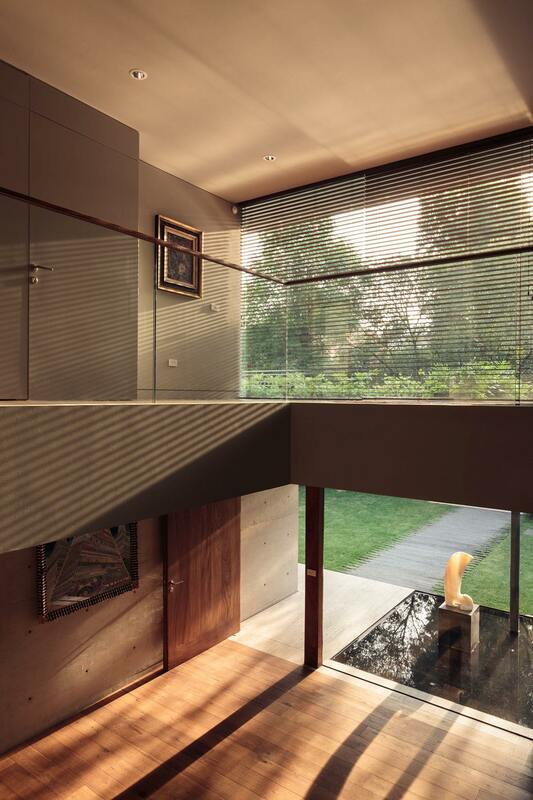 On the upper levels, skylights cast intricate shadows over the main corridors of the home. 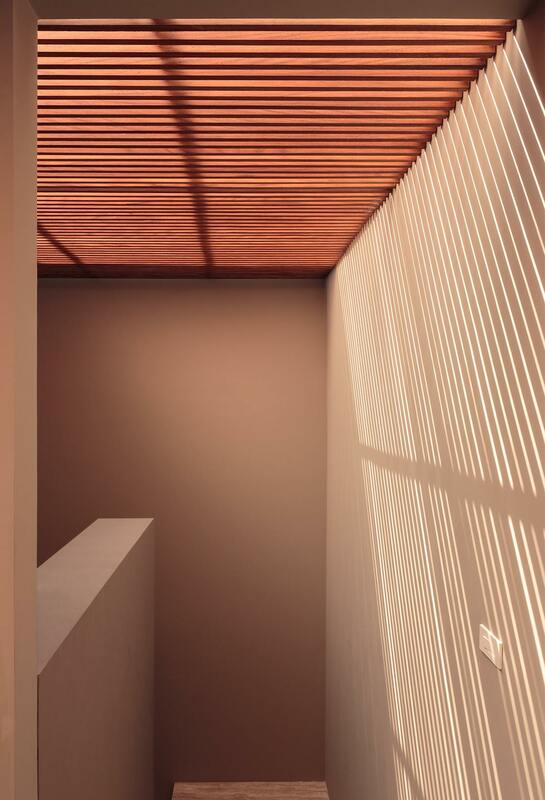 Slatted ceilings certainly contribute an interesting aesthetic to these homes. No matter how many times the technique is repeated, each residence will experience a unique effect. 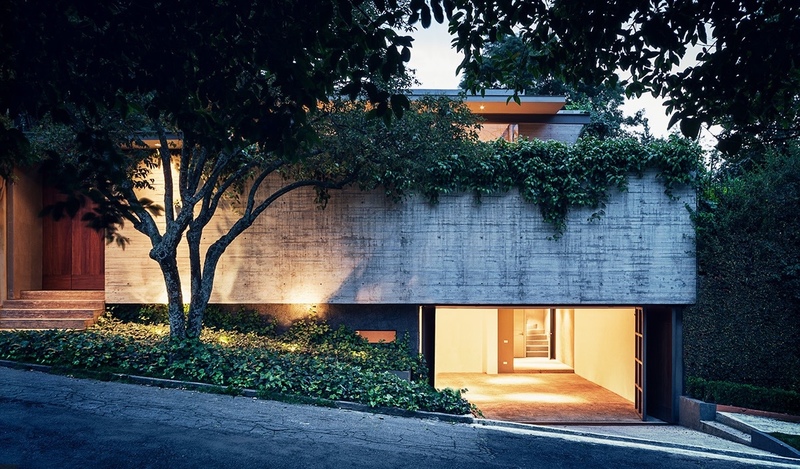 From the substantial concrete cladding of the primary entrance, few would ever be able to predict the spacious and open nature of the interior.